Edit: Chili prep illustration added. My eyes almost popped out of their sockets when I ran into the photo of an innocent looking lumpia with a whole chili head sticking out of one end. Dynamite, that’s what they call it at the restaurant where it’s served. It also appears to be popular in Bacolod. It looked simple enough so I figured I’d give it a try. Because it was mostly experimental, I figured I’d try it using cheap cheese first. I raided the supermarket for a block of processed cheese food (Kraft Cheddar), a pack of finger chilis a.k.a. siling pangsigang, and lumpia wrappers. I assembled it much like you would regular cheesesticks then fried a couple. Fantastic! Crisp, spicy and gooey, it created a wonderful flavor explosion that was as dangerous as it was satisfying. Dangerous, because a wayward chili seed can have you running for the nearest faucet to wash your mouth out. 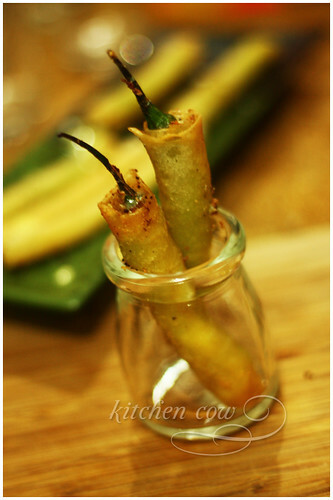 It’s a simpler, crisper and definitely cheaper version of Jalapeno poppers. Planning to try it out with either mozzarella, monterey jack or cream cheese next time. Make some with the instructions below, then grab a beer and the remote control for quality TV munchy time. While wearing rubber gloves, make a lengthwise slit, from almost the top of the chili to the bottom, being careful not to slice through the other end. Slice half of the top, so that you can unroll the chili while still keeping the top intact. Scrape out the seeds. Stuff the chili with cheese. As it lies flat on a plate, fold one side of the lumpia wrapper. 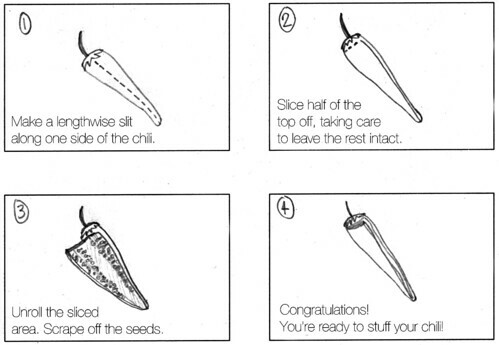 Lay the stuffed chili on the wrapper, keeping the head on the folded part. Fold the wrapper over, roll once, fold the other end inwards, then continue rolling tightly. Dab the wide end with a small amount of water then seal. On high heat, deep fry the rolls until browned. Monitor the frying well so you can remove them before large amounts of cheese spurt out. Let drip on paper towels and serve. NOTE: If you’re preparing this just for yourself, you may want to totally remove the top and seal the whole stuffed chili inside the lumpia wrapper, to lessen the chances of the cheese spurting out. But if you’re serving it to guests, it’s more fun to keep the tops on, so they look like little sticks of dynamite. This entry was posted in recipes and tagged cheese sticks, cheesesticks, chili, chili cheesesticks, jalapeno poppers, lumpia. Bookmark the permalink. Yikes, those do look dangerous…ly tasty! I don’t think I can handle dynamite but I love cheese sticks and these look really pretty! My sister-in-law makes these too, but she fills it with lumpiang shanghai. But now that you’ve mentioned cheese… HMmmmm.. I love dynamite cheeseticks ! I had this in Gerry’s Grill a few months ago. Not bad at all! I was skeptical the first time my tita served this, but I’m now a fan. While it normally doesn’t need a dip, I once tried it with sour cream and it was good. Thanks for sharing the recipe! Wow~ So normal sour cream would do? We make this at home as well. Discovered this at Tapatouille (Tapa-to-eh) over at Banchetto last year. Super yum. So experimented as well, and now make it at home. But, the ones we make has ground pork and cheese inside. Pwedeng ulam. Kekeke. If you can handle the sili in sinigang, I think you can handle these. Just make sure all the seeds are scraped off. LUMPIANG SHANGHAI? Man, that sounds nyummers. Sayang, I made some lumpiang shanghai a few days ago, kaso they’re all rolled up and frozen na Next time, I’ll leave some stuffing to try that out. Ang tagal ko na pala di kumakain sa Gerry’s! Sayang, I could’ve discovered this earlier. Kickstart your research! Screw the coffee, go for chili! Pwede! Now that you mentioned it, parang bagay nga. Mmmmm…looks like we’ll both be trying it that way no? Ground pork sounds good! Did you see Nina’s comment above? Lumpiang shanghai stuffing, tapos cheese! I can die happy. love the illustration. yes, you have to! i have done this but much bigger chillies and stuffed with ground pork. This is a classic whoever thought of this way of cooking chillies is a genius. Best for not-kids-anymore party. I tried making this recipe too and it went well with my ketchup-mustard dip. Super ayos for pulutan! This surely is a dynamite! But I love spicy food! I am hungry now… Looks delicious, and will definitely try this out, and feature it my own site Best Food In Town. Great photos too, you must be a pro photographer! This is yum! Tama ang nasa procedure no. 1, “while wearing rubber gloves…” I already tried making these at hindi pa naulit. Failed to wear gloves which caused chilli burns. Nevertheless, this recipe is great. Whoever thought of this first, we must go find him / her and worship at their shrine. I wouldn’t be surprised if this is from Bicol, with all the chilis there and all. How do you do your ketchup-mustard dip? Sounds interesting, I’d like to try it too! Spicy food for the win! Can you imagine spiking with with siling labuyo pa? Time to cook then! Does Mina like spicy food? Surprise mo s’ya! Thanks for the compliment, but I’m far from being a pro. I just like taking photos when I have free time—which lately, is very seldom. Were you able to try it already? I tried it using mozzarella na, awesome texture but bitin flavor! I think a mix of mozzarella and cheddar will rock. Only one thing to do! Grab some munchies! HAAAAY! I learned the hard too. I thought I washed my hands throughly na pero kulang pa pala. Hours later, I rubbed my nose—boom! Masakit I’m just thankful I didn’t rub my eyes. Thankies pj! Hope you enjoy them. You think it will keep as long as those freezer ready to cook lumpia so I can make a big batch and pop them in hot oil whenever I feel like it? :). I didn’t test how long it’ll keep but yeah, I was able to freeze and fry at will. At the very least, I know it’ll stay okay for 1-2 weeks, though I’m betting that it’ll stay good for months, as long as it’s frozen. Best to fry them frozen too as it lessens the chances of the cheese squirting out before the wrapper’s nicely fried. Just tried this! Fried two at first, just to taste it! Waaaahh…. I cannot handle it! Makahang! KAYA PO BA ITO NG MGA TAONG AYAW NG maanghang? Depende na rin siguro sa tolerance level ng taong ayaw sa maanghang. Yung mga talagang sensitive, hindi kaya. Yung hindi lang mahilig, kaya. Kung gusto mong hindi kasing anghang, dapat siguraduhin mong malinis yung sili. Talagang walang buto tsaka kayasin mo yung loob. Tsaka pwedeng banlian mo muna ng mainit na tubig para maluto ng konti yung sili bago mo i-stuff ng cheese at ibalot. Goodluck, Myleen! Suuuppeerrr yummy anlakas ng thrill nya! !